Iâ€™ve been reviewing countless different Muff clones over the past few years. Although the Big Muff circuit is a fairly basic one, most of these pedals has managed to surprise me and proved to have an unique character of their own. Iâ€™ve had my eyes on the Earthquaker Hoof Fuzz for some time and finally I got around to try one. Hereâ€™s my review. The Hoof Fuzz is housed in a rugged (slightly bigger) MXR sized box featuring a bright led and true bypass switching. The pedal can be operated on either 9V battery or Boss-style adapter. Like all Earthquaker pedals, the Hoof is made by hand with high quality components. The Hoof is a germanium/silicon hybrid Muff based on the old green Sovtek Big Muff Pi. Like its Russian counterpart, the Hoof has controls for fuzz (gain/sustain), level and tone. Thereâ€™s also a fourth control labelled shift. This one changes the frequency response of the tone control. Turn it clockwise for scooping the mids or counterclockwise to enhance or boost the mids. Setting the shift to about noon produce a flat response. Thereâ€™s definitely a close resemblance to the early Sovteks and the green especially. The Hoof has tons of smooth, saturated gain but itâ€™s also capable of producing some really nice and warm overdrive tones. Especially when combined with vintage style low output single coils and a little roll off on the guitar volume. Itâ€™s also a bit lighter on the lower frequencies, which helps on keeping the tone clean and focused and perhaps adding a bit of that Ramâ€™s Head flavour. What I especially like about the Hoof is the dynamic response of the fuzz and level combined. Set the level for a mild boost and the fuzz between 3/4 and fully maxed and you get a super smooth tube-like distortion with rich sustain. In this setting, it also seems to get a bit more compressed with a more pronounced attack. This makes the Hoof well suited for smaller setups and bedroom volume levels. When most fuzz and Muffs tends to get all thin and harsh on lower volume levels, the Hoof manages to produce huge fuzz tones and stay silky smooth. 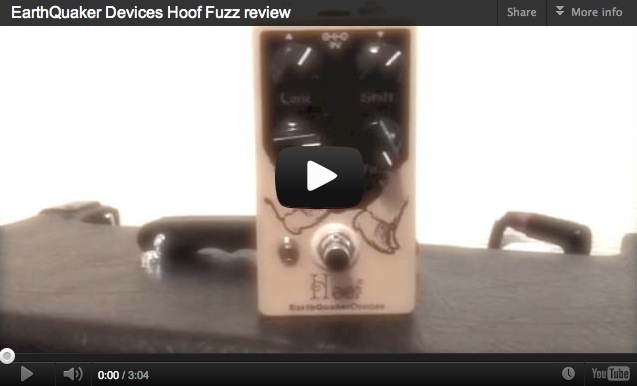 To sum it up, the Hoof Fuzz combines the best of many circuits and eras. 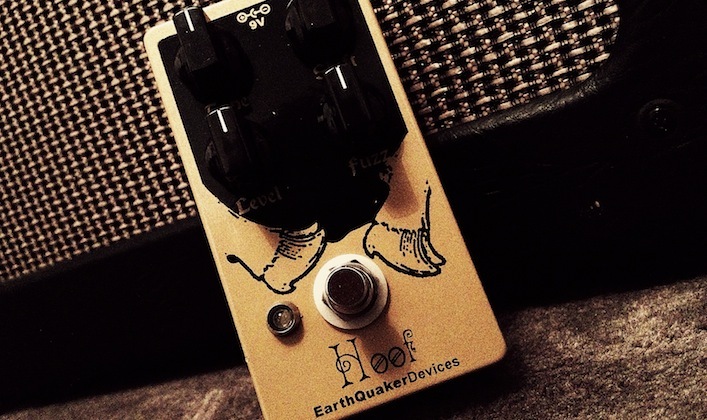 Whether you want warm, classic overdrive, screaming fuzz for those Pompeii and Dark Side tones or a more modern, smooth violin-like sustain, the Hoof will deliver. Highly recommended! Check out EarthQuaker Devices for more details. The Hoof Fuzz was tested for both stage and home setups with a Reeves Custom 50 and a Laney L20 with both single coils and humbuckers. Hey Bjorn, hope everything’s been good for you! I think it does. It has a hint of mids and that raw, open tone you can hear in some of the mid 70s Muff models, which is what David’s used for those albums. I’m torn between the Vick Audio ’73 Rams Head and the EQD Hoof. I’m looking for a kind of Black Keys / Neil Young tone. Could you give any tips? And, if you recommend the Vick, would you suggest I ask for the Bjorn mod? Greetings to u! Could u tell me if the Hoof fuzz sounds closer to a Sovtek Tall Font or Bubble Font? Do you think the hoof fuzz will do a good job of achieving echoes fuzz tones? I managed to dial in the Hoof to sound nearly identical to the Ram side of the Basic Audio Tri/Ram. I’ve been doing a Timmy > Hoof > Naga Viper stack, using the Viper for a lead boost. That literally put me squarely in the early Sabbath realm. Great stuff! sorry for another question, but to get the rat close to a g-2 would you boost with a booster or run it by itself. thanks for the help, i was wondering if it could because the G-2 is a muff with a slightly different gain structure and with germanium diodes. Also do you think the rat could do G-2 tones better? hey bjorn hope everything is going splendid for ya, my one question is, since it has a combination of germanium and silicon do you think you could set it for convincing G-2 tones? Hi Bjorn! Congratulatons on this clip. The tone is killer! I have a few basic questions about the Hoof Fuzz. 1 – How well does it clean up when we roll down the volume? 2 – Does it work well with a clean Booster? 3 – You think it works well with a small gig amp such as a Fender Blues Jr.? I think this might be the muff/clone for me! I’ve been deliberating for ages but I’ve finally decided on this one, probably! I also wanted to say thanks for running such an awesome site. I completely re-worked my old MIJ 50’s strat to be a very respectable Gilmourish guitar in the summer. I stripped the body, re-finished in black nitro and installed an Overdrive guitar works loaded pickguard with the Fat 50’s, CS 69 and SSL-1 DG – it plays and sounds like a dream. One of these just popped up locally for $110, think I’ll have to grab it! Hi Bjorn, this looks and sounds like a great pedal! I will have to keep it in mind. On a very different note, I am curious if you’ve tried any effects by Catalinbread? Specifically their Echorec clone delay and the RAF “Royal Albert Hall”. The delay looks like something right up your alley but the RAF is of course based on Jimmy Page’s Hiwatt tone from their 1970 performance there. I know that is perhaps a completely different tone than what this site is about, but after hearing it in their videos, I was completely blown away and am curious if this is a pedal you are curious about trying at all. is this recorded with the Laney Cub or the Reeves? Also, may I ask you why you do Reverb and Delay in Logic and not in pedals before the mic? Hey Kit Rae! Great to see you are still out there, in the guitar side of things! I often stop by your site for information and to see if you have updated your page…been a while. Hope to come across some updates sometime. Both Gilmourish and the Kitrae site are indispensable resources…a great thanks to both of you for the countless hours you two have dedicated to share your knowledge and passion. Another great review Bjorn. I have had the Hoof for about a year now. It is one of my favorite muff clones, and probably the best use of a mids control knob in a BMP, and very Gilmourish. Jamie, the guy who built the original, did start by making a clone of one of Dan Auerbach’s Sovtek BMP’s, but what Jamie ended up making is closer to a violet Ram’s Head circuit than a Sovtek. It’s the Germanium transistors and LED diodes in the clipping stages that give it that Russian Big Muff type of sound. I’ve had the Hoof Fuzz for around 8 months and how it cuts in a live band mix is what really sets it apart from other Fuzz pedals. I can also get some non-Muff fuzztones out of it, such a colorful Fuzz pedal. How close is the EQD Hoof to a Green Russian Muff and at what setting would I use to get it in the GRM realm? I’ve always wanted a GRM but not willing to shell out the cash for one. I’m hooked on this site. Crap, Rainbows, Prisms, triangles, DG, and references to one PF song or anther, as long as there is a market for “Gilmourish” products! PS-Tom assures me that my DG Strat will be in my hands by the end of next week. ( It’s been over 6 months) I hope he’s right! I know luthiers are famous for taking forever, but the wait is driving me nuts! Hey Bjorn, please disregard my frantic posts from this morning! I did the only thing I could, they’re giving me one more new one. When I picked up the last one, I shouldn’t have taken it, the box was very beaten up. The 3rd new one comes in next week, it’s not going home until it’s been thoroughly checked out, and if it’s not 100% up to snuff, I’m going to get my money back. It came down to doing it this way, or spending a bunch of money for something they don’t even have in stock. I’m worried about the quality of the 30, but hopefully I’ll get lucky this time. I played every amp again, and even amps at three times the price don’t have the ability to get loud, and clean, but right on the edge of break up. Like the new Fender hot rods, the clean never gets close to breaking up, and the master volume/ gain side never gets clean. Very frustrating, but if I do get one that wasn’t beat to death in shipping, and holds up, I will be perfectly happy to have it until I get the Reeves. I should have sent this via email, but you know how excitable I can be, and freaked out over this a little this morning. Thanks for dealing with my rants, you’re a good man Charlie Brown! Could you tell me what would be the best pedal out of these three to produce David’s big muff and Pompeii sounds: Musket, Colosus or this? Great review as always. Surprised how ‘fuzz face’ like the beginning of your demo sounds. How would you set the Hoof to emulate a fuzz face like that? Will my EH green russian do that? What settings? Interesting note: the Hoof Fuzz was cloned from Dan Auerbach’s (The Black Keys) green Russian. Jamie Stillman, the guy behind Earthquaker Devices is the TBK’s former tour manager/tech. Awesome review bjorn! But i liked better when we could see you actually playing haha, learned some stuff there! Wow, the first Muff clone video that makes me think of taking the Musket off the board. I love the smoothness when you rolled back the Fuzz in the very last, “Wet” part of the clip. I think I’m just gonna have to check this one out! After I pay for the Reeves! God, this is getting to be really expensive….. AGAIN! As always, nice review Bjorn. For smaller setups do you think the Hoof Fuzz or the Mojo Hand Colossus? Gilmourish always gives me GAS! Wow!!! Sounds like a great pedal Bjorn…one question though, at the end of the clip you list the effects you are using including the Tube Driver. Is the Tube Driver always being utilized during this vid because it seems that it would directly effect the OD/Dist/fuzz/muff that you are highlighting and therefore we are not truly aware of the sound of this pedal on its own. Just wondering on your thoughts on this. Keep up the great work Bjorn…We are all grateful for the time you put into this site! Nice review and playing Bjorn (as always). I love the EQD Hoof because it sounds spot on (from what I can remember) to the Sovtek Green Russian that I used to own about 3 years ago. I regret selling my Sovtek, but it became such a hassle fixing it that I decided it was time to let go of it. So I discover this amazing pedal about a year ago and I personally think it’s one of the best Green Russian clones out there. I think the only one that can compete with it is the Wren & Cuff Tall Font Russian, which I haven’t tried out myself yet. Anyway, the Hoof is a great, versatile pedal and as you demonstrate in the video, it’s capable of great overdrive to fuzz face like tones.